So tonight I did what I seem to do at least half the time in the city. I saw a show. This particular show as at the 59E59 Theater. It was a lovely night, if a bit overcast, so I walked back to the subway station for the red line, which is at Columbus Circle. This route took me along the southern border of Central Park. Central Park is a really interesting piece of history. In fact, it was originally created to keep people from hanging out in cemeteries for recreation. Today it houses the Delacourte Theater, home to the greatest public performing arts event ever, Shakespeare in the Park, several bodies of water, over 35 playgrounds, a zoo, a castle, and of course, Bethesda. Don't blink, Doctor Who and Angels in America fans. She moves. Central Park is also the big place you avoid at night according to out-of-towners. (Although a lot of that fear seems to be based on a case that is over twenty years old now, and there is now a whole branch of the NYPD dedicated to the Park.) So let me clarify for all the worriers: I was not walking in the Park. I was walking along the border, where all the carriage horses are. So I’m walking home around ten o’clock, and I begin to notice how strange the Park looks in the dark. The shadows seem deeper and darker than any I’ve ever seen them, and the street lamps have a Magritte kind of light, the orb of yellow extending less than it should. Needless to say, I’m just a little freaked out, but also intrigued. It’s the first time I’ve ever felt like I was living in a world I’d read about in literature. I felt like I had walked into a world created by Neil Gaiman, that if I took one step into the Park, I would be swallowed up into some strange, new, terrifying adventure. 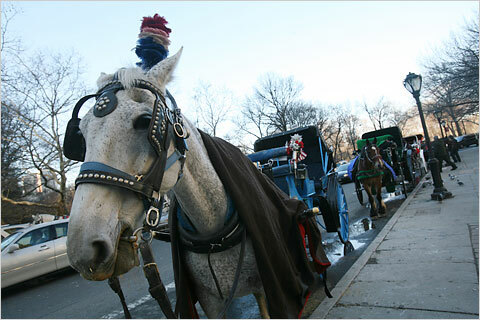 …And then all the carriage horses started looking at me, and walking towards me when I went by. They literally clopped up onto the sidewalk. I’m allergic to horses, and a bit terrified of them, to be honest. They’re big and very smart, and I always feel bad about what we do to them with the whole “pull the wagons, carry me” thing. So I’m suddenly stuck between the beautiful, intimidating, very sentient creatures walking towards me and the shadowy Central Park. I kind of felt like Richard Mayhew in Neverwhere. All I needed was to run into Door. Remember when you were little and thought that if you hated your life hard enough, if you got really, really bored and really, really sad, the Cat in the Hat would show up, or a twister would drop you in Oz, or you would find the Subtle Knife that could take you to Lyra’s world? (That could’ve been just me.) Well, for about forty seconds there, before the drivers got the horses to calm down, I was a few steps closer to the world of my childhood. It was pretty magical indeed. Anyway, as penance, I’m going to take a cue from my friend Jessica and give you more posts for you money. So today I’m going to talk a bit about the flight to Pittsburgh, pretty much forgetting how to get around the city I’ve called home for three years, seeing a dog maul a gay couple with a baby (after the jump. Seriously. ), and about the subway ride to the airport, where I realized some very interesting conclusions. Christina Hendricks Is More Than Her Curves! Doesn’t it seem like it’s always Fashion Week somewhere? New York magazine recently did a feature on Christina Hendricks’ modeling work. She appears on the cover in a corset, apparently from her own closet. Okay. Now look at her face.